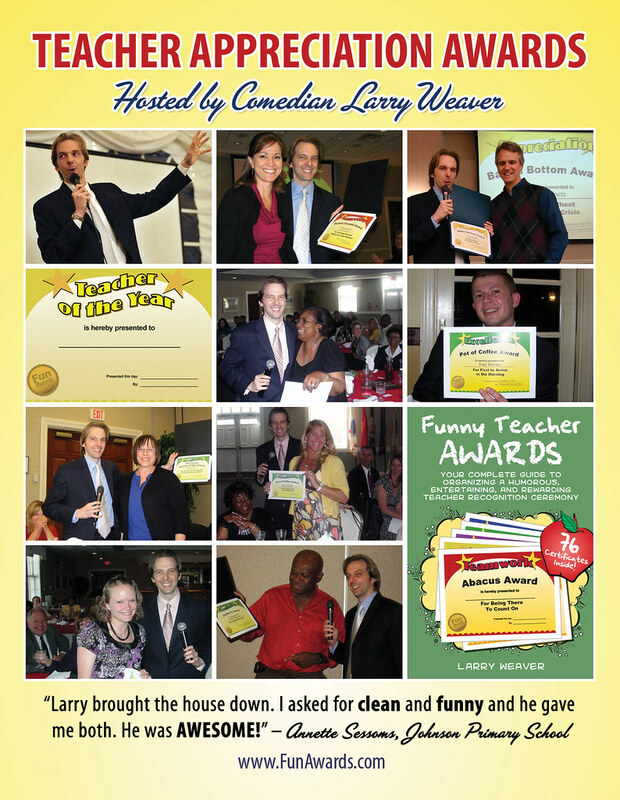 For Teacher Appreciation Day 2011, give your entire staff some much-needed laughter with a performance by comedian Larry Weaver. Full of customized jokes, everyone will love participating in this highly-interactive and hilarious presentation! Larry Weaver's Teacher Appreciation Awards Show begins with an opening stand-up comedy routine. Then the Awards show portion begins. As the winners come up to claim the Awards, Larry will prompt them for a little back story and “acceptance speech”. Watch the hilarity unfold as Larry hands out funny awards that will have your whole audience laughing. Recognize that member who takes the last cup of coffee, is always losing paperwork, or can never be found. "Larry brought the house down. I asked for clean and funny and he gave me both. He was AWESOME!"